I’ve always had a love of theater and admire anyone who can stand up on stage and sing and act with huge confidence. Adults spend years rehearsing and training to get to the point where they can sing, dance and act on stage and make it look effortless. The person you’re about to see performing is not an adult but a 3-year-old boy and probably the youngest I’ve ever seen perform the National Anthem. His performance is melting so many hearts and already almost half a million have watched the video of him singing. 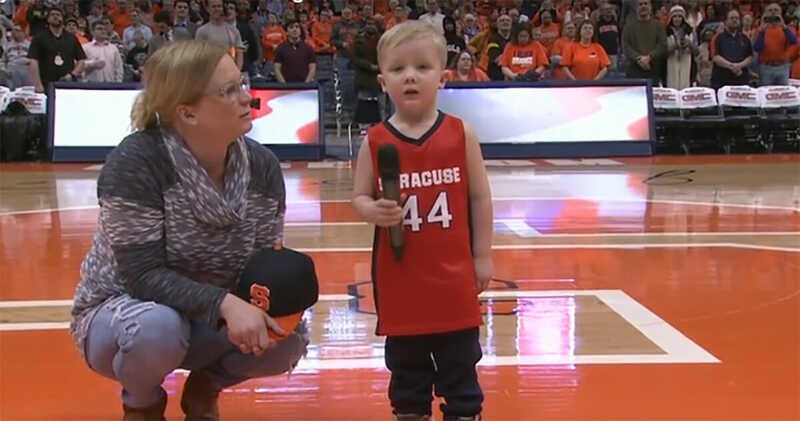 Three-year-old Drake Winslow is the youngest person to sing the National Anthem in the history of School Day game in Syracuse, New York. This confident little boy not only sang the song flawlessly but performed in front of 6,000 people. His amazing performance was met with a standing ovation. “I just think he’s too little to realize how big of a deal it is,” said Drake’s mother, Chelsea, who stood by his side as he sang. His mom says her sweet son loves to sing around the house but his favorite song has always been Star Spangled Banner. Now he can’t wait to sing it again, according to Tip Hero. Watch Drake’s dorable performance in the clip below. What a sweet soul this young boy is. I hope he continues to do what he loves to do as it makes so many people happy. Please share this uplifting story with your friends and family.